Incremental principal components analysis (IPCA). Linear dimensionality reduction using Singular Value Decomposition of the data, keeping only the most significant singular vectors to project the data to a lower dimensional space. The input data is centered but not scaled for each feature before applying the SVD. Depending on the size of the input data, this algorithm can be much more memory efficient than a PCA. This algorithm has constant memory complexity, on the order of batch_size, enabling use of np.memmap files without loading the entire file into memory. The computational overhead of each SVD is O(batch_size * n_features ** 2), but only 2 * batch_size samples remain in memory at a time. There will be n_samples / batch_size SVD computations to get the principal components, versus 1 large SVD of complexity O(n_samples * n_features ** 2) for PCA. Number of components to keep. If n_components `` is ``None, then n_components is set to min(n_samples, n_features). When True (False by default) the components_ vectors are divided by n_samples times components_ to ensure uncorrelated outputs with unit component-wise variances. Whitening will remove some information from the transformed signal (the relative variance scales of the components) but can sometimes improve the predictive accuracy of the downstream estimators by making data respect some hard-wired assumptions. If False, X will be overwritten. copy=False can be used to save memory but is unsafe for general use. The number of samples to use for each batch. Only used when calling fit. If batch_size is None, then batch_size is inferred from the data and set to 5 * n_features, to provide a balance between approximation accuracy and memory consumption. Variance explained by each of the selected components. Percentage of variance explained by each of the selected components. If all components are stored, the sum of explained variances is equal to 1.0. The singular values corresponding to each of the selected components. The singular values are equal to the 2-norms of the n_components variables in the lower-dimensional space. Per-feature empirical mean, aggregate over calls to partial_fit. Per-feature empirical variance, aggregate over calls to partial_fit. The estimated noise covariance following the Probabilistic PCA model from Tipping and Bishop 1999. See “Pattern Recognition and Machine Learning” by C. Bishop, 12.2.1 p. 574 or http://www.miketipping.com/papers/met-mppca.pdf. The estimated number of components. Relevant when n_components=None. The number of samples processed by the estimator. Will be reset on new calls to fit, but increments across partial_fit calls. We have specifically abstained from an optimization used by authors of both papers, a QR decomposition used in specific situations to reduce the algorithmic complexity of the SVD. The source for this technique is Matrix Computations, Third Edition, G. Holub and C. Van Loan, Chapter 5, section 5.4.4, pp 252-253.. This technique has been omitted because it is advantageous only when decomposing a matrix with n_samples (rows) >= 5/3 * n_features (columns), and hurts the readability of the implemented algorithm. This would be a good opportunity for future optimization, if it is deemed necessary. D. Ross, J. Lim, R. Lin, M. Yang. Incremental Learning for Robust Visual Tracking, International Journal of Computer Vision, Volume 77, Issue 1-3, pp. 125-141, May 2008. G. Golub and C. Van Loan. Matrix Computations, Third Edition, Chapter 5, Section 5.4.4, pp. 252-253.
fit(self, X[, y]) Fit the model with X, using minibatches of size batch_size. get_covariance(self) Compute data covariance with the generative model. get_precision(self) Compute data precision matrix with the generative model. inverse_transform(self, X) Transform data back to its original space. partial_fit(self, X[, y, check_input]) Incremental fit with X.
transform(self, X) Apply dimensionality reduction to X. Fit the model with X, using minibatches of size batch_size. 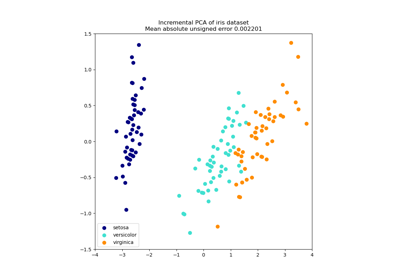 Compute data covariance with the generative model. cov = components_.T * S**2 * components_ + sigma2 * eye(n_features) where S**2 contains the explained variances, and sigma2 contains the noise variances. Compute data precision matrix with the generative model. Equals the inverse of the covariance but computed with the matrix inversion lemma for efficiency. Transform data back to its original space. In other words, return an input X_original whose transform would be X. New data, where n_samples is the number of samples and n_components is the number of components. If whitening is enabled, inverse_transform will compute the exact inverse operation, which includes reversing whitening. Incremental fit with X. All of X is processed as a single batch. Apply dimensionality reduction to X.
X is projected on the first principal components previously extracted from a training set. New data, where n_samples is the number of samples and n_features is the number of features.